Freedom and Flourishing: How long does it take for GDP growth to be reflected in higher well-being? How long does it take for GDP growth to be reflected in higher well-being? One possible explanation, discussed briefly by Easterly, is that there may be ‘long and variable lags’ in the relationship between quality of life and economic growth. A related possibility, that is supported by some simple analysis I have undertaken for OECD countries, is that well-being is affected by wealth (reflected in quality of housing, financial assets, human capital, public infrastructure, social capital etc.) as well as current income. In this post I want to explore this possibility for a wider range of countries using the Legatum prosperity index. As noted in my last post, the Legatum prosperity index is highly correlated with the OECD’s well-being index. The results are consistent with the view that well-being is affected by wealth as well as current income. For the index as a whole, the estimated coefficient on the variable reflecting relatively recent growth is substantially lower than that on the variables reflecting past growth experience. The results for some components of the index also support that interpretation. Economy: The estimated coefficient on relatively recent growth is actually higher than that on the variables reflecting previous growth experience. That result is to be expected because the economy variable is derived from a range of indicators of recent economic performance. Entrepreneurship and opportunity: The low estimated coefficient on relatively recent growth is to be expected because an entrepreneurial culture takes time to develop. I usually think of causation running in the opposite direction – from an entrepreneurial culture to economic growth – but success often breeds success. Governance: It may not appear to make a lot of sense to view low levels of corruption as a consequence of economic growth, rather than vice versa, but some of the indicators covered (e.g. political rights and regime stability) could reflect a build-up of institutional capital that has been fostered by economic success. Education: As expected, the estimated coefficient on relatively recent growth is lower than on previous growth experience, reflecting the time it takes for improved education of young people to be reflected in the stock of human capital. Some of the indicators covered in the education variable reflect current enrolments rather than education levels of the population. Health: Reasons for the low estimated coefficient on relatively recent growth would include investment required to improve sanitation and water quality, and the time required for training of health professionals. Safety and security: As expected, countries with a long history of relatively high per capita incomes tend to have less violence. Low violence is conducive to economic activity and economic opportunities reduce the incentive to engage in criminal activities. The relatively low estimated coefficient on the recent growth variable suggests that economic growth has a greater positive impact on safety and security when it is sustained over a couple of decades. Personal Freedom: Civil liberties, satisfaction with freedom and tolerant attitudes are strongly associated with a history of relatively high per capita incomes. The results do not shed much light on the effects of more recent growth experience. Social Capital: Again, relevant indicators such as trust and perceptions of social support are associated with a history of relatively high per capita incomes, with greater ambiguity in respect of recent growth experience. 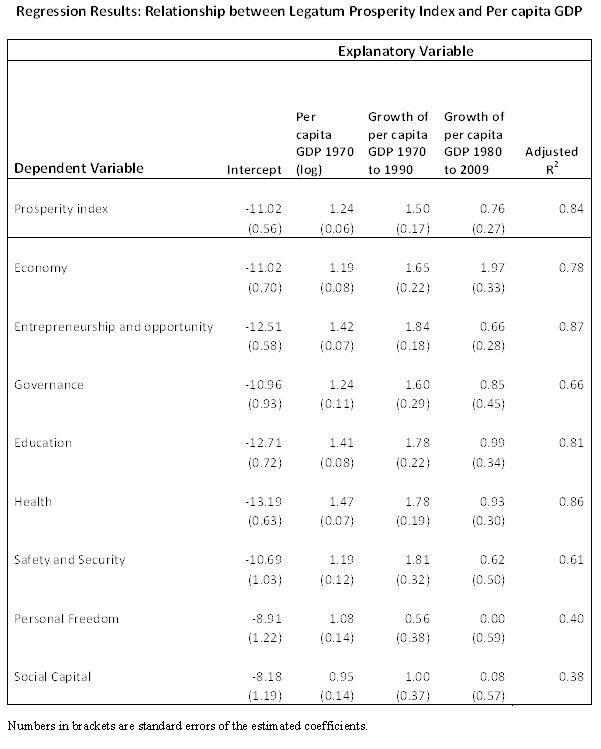 The regression results also indicate that the relevance of per capita income to explanation of the various components of the index varies considerably. Income history seems to be much more relevant to education and health outcomes than to personal freedom and social capital. Performance in relation to factors such as social capital helps to explain why some countries (e.g. New Zealand) have higher overall index scores while other countries (e.g. 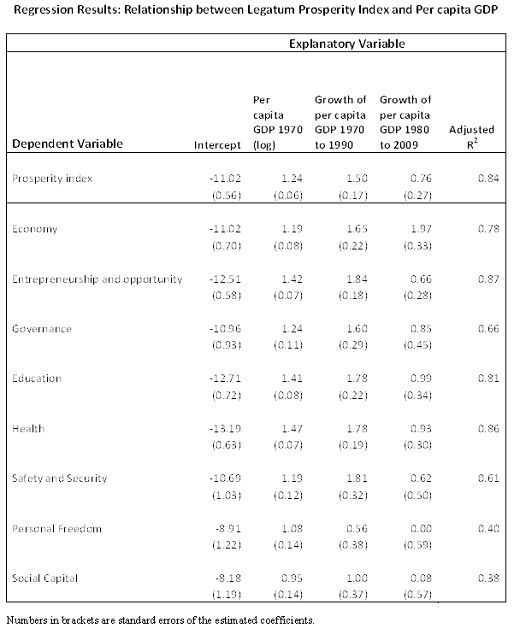 Greece) have lower overall index scores than would be predicted on the basis of income history. Finally, to answer the original question, the results reported here suggest that it can take two or three decades for GDP growth to be fully reflected in higher well-being levels. I liked the post, thanks! I think you are right in your comment about causality in relation to the component Entreneurship. It would be interesting to undertake some formal causality testing for some of the components - especially Governance. Thanks Dave. Would you like me to send you the data file?